*Postcard Exclusive to Blow Up shop. Initial orders only while stocks last. Free Digital Download available on release. Fay wrote the majority of the songs in a two day whirlwind writing session after returning from a tour of Italy, which ultimately inspired this atmospheric eclectic album. 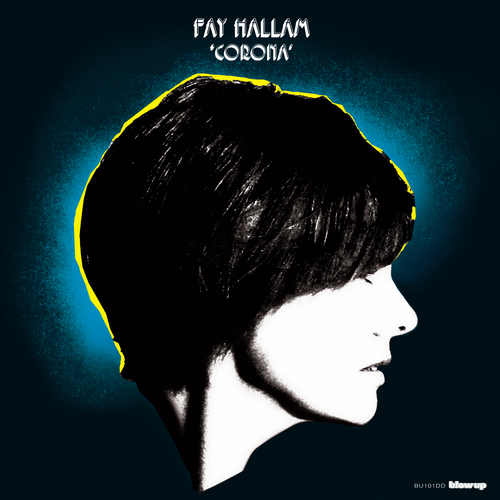 ‘Corona’ has absorbed Fay’s love for the Bossa Nova of Antonio Carlos Jobim and Astrud Gilberto, the experimental productions of the Carpenters and the eclecticism of Beck. There’s even a nod to the 50’s pop of Frankie Laine with ‘Giving Myself Away’ and a sole cover: Paul McCartney’s classic ‘Maybe I’m Amazed’ joins the new set of songs. Originally from Wolverhampton, vocalist and keyboard player Fay Hallam has performed over the years in acts such as Makin' Time (with a pre-The Charlatans Martin Blunt), The Prime Movers, Phaze and The Fay Hallam Trinity. She has worked with Billy Childish, Graham Day, Alan Crockford and other luminaries of the Medway Scene where she has lived for many years. She has toured the UK and Europe extensively. "The welcome return of Fay Hallam" Shindig!